n you install wilcom 9 on a computer that is running windows 8 64 bit duo core processor using virtualbox running windows XP? Yes you can install it..
How to run incompatible software in another operating system? Generally it happen that our software are not compatible with all operating systems. Some of software are compatible with Window 7 only and not working with other OS. Finally, we have to compromise our OS choice to our Software compatible requirement. Similarly, our Embroidery Software are not compatible with some Operating System, for example: Wilcom ES Version 9.0 is not compatible with Window 7, it run on Window Xp operating system. So in this case even though we would like to have window 7 installed on our computer we have to installed window XP for our Embroidery Software. This problem can be solved by installing a another OS on your PC, but in that case you have to restart your PC to swap your Operating system. In other word you have to select the operating system at the time of starting of your computer. So any other solution to run two Operating system simaltenously on same PC with restarting your computer??? 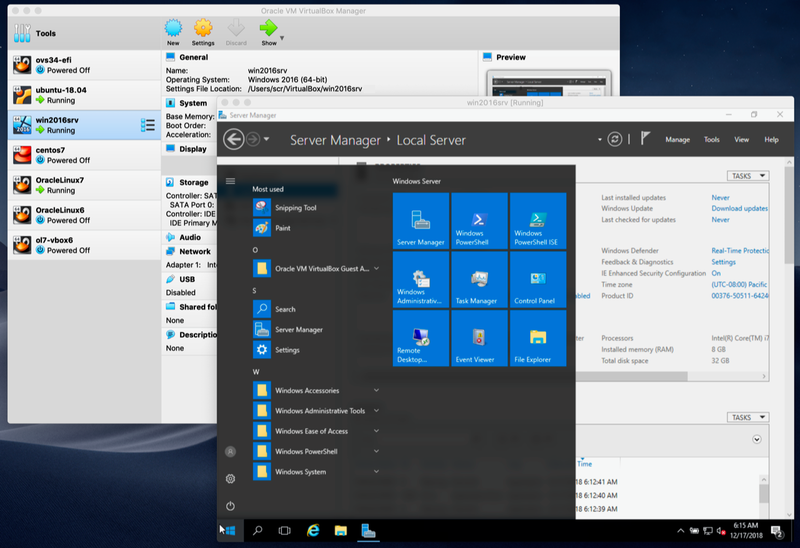 Yes, it is possible, you can run any number of operating on your PC with out restarting your Computer by the help of 'Virtual Box'. Just install a Virtual Box on your PC and then installed any operating system on virtual box and run it any time on your current primary OS system with one click. By the help of Virtual box, you can run any number of OS together and in any combination.For example; if your Wilcom Es is not working with Window 7 then installed Virutal box on your PC and then install XP on your Virtual box. Now, double on the Virtual Box icon whenever you want to run Window XP. The Xp will now run like any other application software with double click with in same Window 7 OS. Running multiple operating systems simultaneously. VirtualBox allows you to run more than one operating system at a time. This way, you can run software written for one operating system on another (for example, Windows software on Linux or a Mac) without having to reboot to use it. Since you can configure what kinds of "virtual" hardware should be presented to each such operating system, you can install an old operating system such as DOS or OS/2 even if your real computer's hardware is no longer supported by that operating system.Further, you can even save the status of your OS, so that you do not have to start the OS again. Your OS setting will be saved and you dnt have to restart it over again and again. Sometimes you just need another operating system. For instance, some programs will not run in your current operating system but you don’t want to lose that piece of software. So, your favorite program ran in Windows XP but not in Windows 7–use VirtualBox to put Windows XP on your system and now you have access to the program. Level of Knowledge reuqired to install it? It required a intermediate level of Computer Knowledge. Where do i get this Virtual Box? Get this virtual box on the official website of Virtual Box. Running a Wilcom ES version 9.0 Software compatible with Window XP on Window 7 without restarting PC. 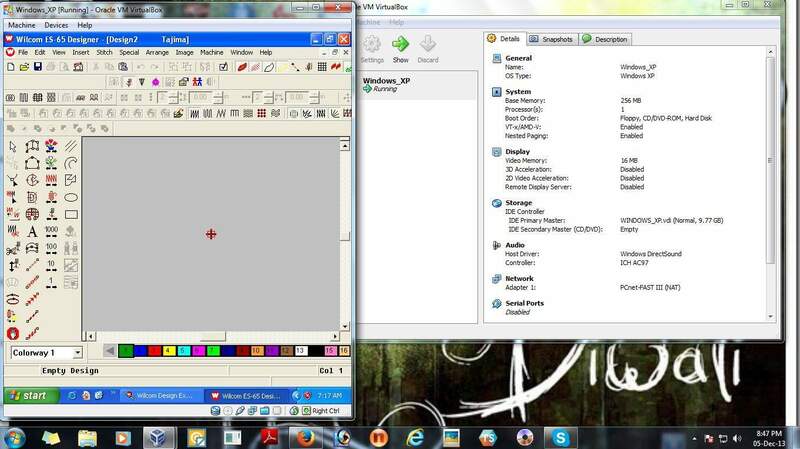 In above image we have shown you how to run the incompatible embroidery software on window 7. The software is not compatible with window 7 but still it is running with in window 7 using Window XP on virtual server. If you face any problem in installing virtual knowledge then leave a message over here our team would reply to your query as soon as possible.